One of Los Angeles' most influential architects, Jon Jerde, who recently passed away, was known for the ebullience and animation of his designs. 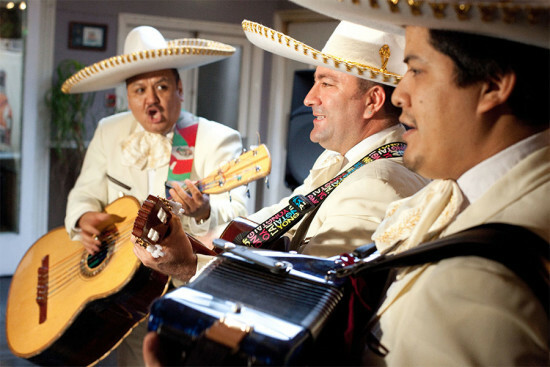 So it was only fitting that his funeral be held at LA’s stunning Union Station, inside the Grand Concourse, accompanied by nothing less than a full Mariachi band. When Eavesdrop finally goes to the Page Six in the sky, this is exactly how we would like to go out. After refining their master plan over the last several months, Metro, Grimshaw, and Gruen are ready, as Metro Deputy Executive Officer for Countywide Planning Jenna Hornstock put it, to "put the pedal to the metal." They're asking the Metro Planning and Programming Committee to approve several recommendations (PDF) to begin the implementation of their Union Station Master Plan, including the development of a Program Environmental Impact Report. Yesterday they presented to the committee, and a vote is expected at the next gathering on October 15. After sitting down yesterday with Hornstock, Grimshaw partner Vincent Chang and Gruen partner Debra Gerod, AN has an even clearer idea of their plans. The ambitious scheme, which will be carried out in stages, will greatly improve connections to Alameda Street and the Pueblo de Los Angeles to the west and to Vignes Street and the Los Angeles River to the east, vastly expand and upgrade the station's concourses, map out mixed-use development site-wide, and plan for the eventual incorporation of High Speed Rail. Renderings are beginning to look much more real, as is the whole endeavor. To the west the team is planning a large forecourt, or "outdoor room," replacing what is largely surface parking in front of the station. They're heavily programming it with open space, tables and seats, a cafe, community amenity kiosks, bike facilities, water features, and shade trees. Street improvements will calm traffic on Alameda and rows of trees will connect the station to the Plaza. The concourse behind Union Station, programmed with more retail and amenities, will be significantly widened and opened to natural light, with openings cut between platforms and elevators and escalators improving access to tracks. Its flaring shape will trace not only the path of trains but of local subways. Above the tracks the team is investigating a planted, criss-crossing bridge structure providing another level of access across the site. A new east portal behind the tracks–largely open to the sky–will open to another plaza, creating a new public face east of the station where Patsaouras Transit Plaza currently sits. If the plan is approved the facility will be moved to the center of the station, branching into a north/south open space and a lower west terrace (inspired by Union Station's lovely courtyards) forming, pending approvals, where the Mozaic Apartments and a facility for Amtrak currently sit. The team is mapping out about 3.25 million square feet of commercial, retail, residential, and hotel development over the more than 40 acres that Metro owns around the station. With the support of the California High Speed Rail Commission the team will also move to accommodate High Speed Rail, perhaps on a site east of Vignes Street that encompasses the city's aging Piper Center. That move is still pending issues like funding and track alignments. 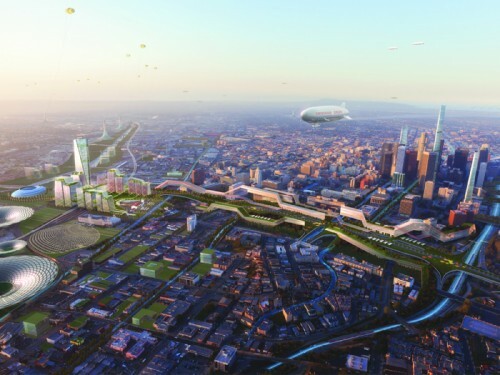 "This is a completely new way of engaging the city," commented Chang, who sees the station as a centerpiece and growth catalyst not only for its neighborhood but for all of Downtown Los Angeles. His team hopes to proceed first with the development of the forecourt and other perimeter spaces, which he calls a "quick win," then move on to more challenging task of rebuilding the concourse, the transit plaza, the east portal, and so on . 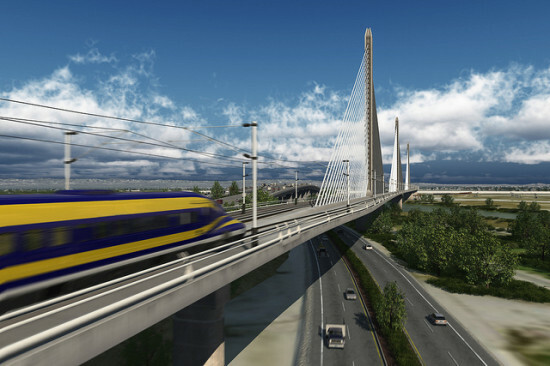 Despite ongoing delays, lawsuits, and government holdups, it appears that California's High Speed Rail (HSR) plans (and their associated stations) are ready to move ahead. Last week the United States Department of Transportation issued a "Record of Decision" for HSR's initial 114-mile section from Fresno to Bakersfield. The decision, "represents a major step forward, both for the State of California and for High Performance rail in the U.S," Secretary of Transportation Anthony Foxx said in a statement. On the state level California governor Jerry Brown earlier this month managed to secure $250 million for the project from the state's yearly cap-and-trade greenhouse gas emissions fund. That number could total $3 billion to $5 billion in coming years. The total amount of track built in the network will measure over 800 miles. But the estimated $68 billion project is still short of the federal funding it needs, and there are a number of significant obstacles left. According to the Contra Costa Times, a Sacramento judge has blocked, pending appeal, the $8.6 billion in state bond funds owed to the project. The state also owes the federal government $160 million in order to receive $3.5 billion in matching funds, and the U.S. House of Representatives has voted to block funds to the project as part of the federal transportation bill. Although that vote is anticipated to be overturned by the Democratic Senate. Still, California's HSR stations continue to move ahead, regardless of whether the tracks ever get built. Grimshaw and Gruen's plans to transform Union Station in Los Angeles just passed another benchmark, Pelli Clarke Pelli's San Francisco's Transbay Center is moving ahead as well, although perhaps without its signature rooftop park. And the furthest along is Anaheim's ETFE-topped ARTIC station, designed by HOK and Buro Happold. The multimodal facility combining bus, rail, high speed rail, shuttles, and more—is scheduled to be finished late this year. All of these stations will serve multiple transit functions, even if HSR never happens. But it sure would be a waste if that came to pass. No Further West: The Story of Los Angeles Union Station Los Angeles Public Library, Central Library 630 West 5th Street, Los Angeles, CA Through August 10 Known as the “Last of the Great Railway Stations,” Los Angeles Union Station receives due recognition with the exhibition entitled No Further West: The Story of Los Angeles Union Station. Organized by the Getty Research Institute, the exhibition will span from the station’s construction in 1939, when its construction became an incidental platform for racial issues of the era, to today, when it serves 60,000 commuter passengers daily. 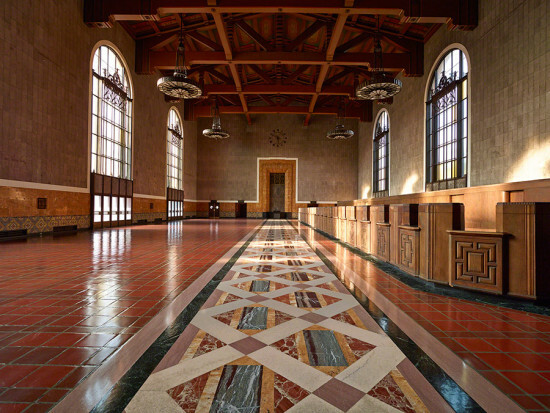 Photographs, architectural drawings, and other archival items will all relay the story of the station’s journey from a basic transportation hub to an important centerpiece of Southern California architecture. The Los Angeles Public Library—an iconic cultural centerpiece itself—hosts the exhibition until August 10. Rotterdam Centraal Station's relationship to the existing urban fabric called for different treatments of its north and south facades. To call the commission for a new central railway station in Rotterdam complicated would be an understatement. The project had multiple clients, including the city council and the railway company ProRail. The program was complex, encompassing the north and south station halls, train platforms, concourse, commercial space, offices, outdoor public space, and more. Finally, there was the station’s relationship to Rotterdam itself: while city leaders envisioned the south entrance as a monumental gateway to the city, the proximity of an historic neighborhood to the north necessitated a more temperate approach. Team CS, a collaboration among Benthem Crouwel Architekten, MVSA Meyer en Van Schooten Architecten, and West 8, achieved a balancing act with a multipart facade conceived over the project’s decade-long gestation. 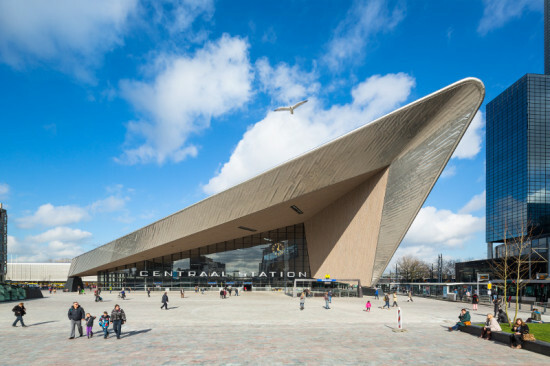 On the south, Rotterdam Centraal Station trumpets its presence with a swooping triangular stainless steel and glass entryway, while to the north a delicate glass-house exterior defers to the surrounding urban fabric. Team CS, which formed in response to the 2003 competition to design the station, began with a practical question: how should they cover the railroad tracks? Rotterdam Centraal Station serves Dutch Railways, the European High Speed Train network, and RandstadRail, the regional light rail system. Team CS wanted to enclose all of the tracks within a single structure, but they came up against two problems. First, the client team had budgeted for multiple freestanding shelters rather than a full roof. Second, this part of the project was designated a design-construct tender in which the winning contractor would have a high degree of control over the final design. To work around both issues, Team CS turned to an unusual source: agricultural buildings. “We started to come up with a project built from catalog materials, so efficient and so simple that any contractor would maybe think, ‘I’m going to build what they draw because then I can do a competition on being cheap, and then I don’t need to [reinvent] the wheel,’” explained West 8’s Geuze. For the spans, they chose prelaminated wood beams meant for barns and similar structures from GLC. They designed the five-acre roof as an oversized Venlo greenhouse. It comprises 30,000 laminated glass panels manufactured by Scheuten. Integrated solar cells, also provided by Scheuten, produce about one-third of the energy required to run Rotterdam Centraal Station’s escalators. This is big: Our sources divulge that UK firm Grimshaw and LA-based Gruen Associates have won the commission to master plan the six million square feet of entitlements at Union Station in Los Angeles. A formal announcement is expected this coming Monday on Metro's web site (our leak is unconfirmed), with the Metro board approving the firms after that. Grimshaw has made a name for itself designing infrastructure and transit stations around the world, including Lower Manhattan's upcoming Fulton Street Transit Center and London's Waterloo Station. Gruen recently completed design on phase one of the Expo Line and has served as executive architect on several recent projects, including the Pacific Design Center. The site around Union Station encompasses about 38 acres and is anticipated to become a transit and commercial hub for the city. 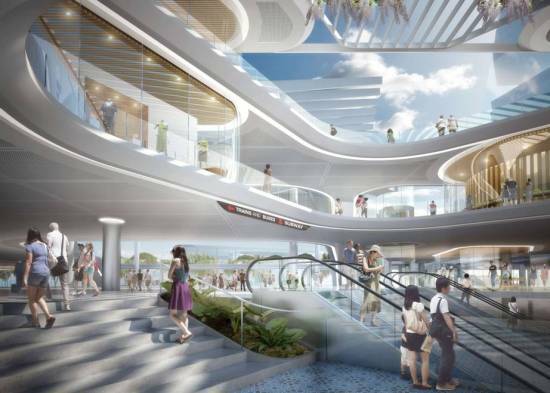 It will likely include offices, residences, retail, entertainment, parks and a potential high speed rail station.